Is your skin tired? Feeling overwhelmed? Do you look a little on the weary side of things? I have just the thing for you! It's Nyakio's Chamomile Soothing Sleep Mask. This hydrating overnight facial instantly softens skin with powerful, long-lasting moisture and nourishment. This comforting cream mask works through the evening to calm & rejuvenate fatigued skin with a soothing blend of chamomile, caldendula and aloe vera. Wake up to soft, supple radiant skin; done without sulfates, phthatlates, mineral oil, petrolatum, formaldehyde and butelyene glycol. Rich in global beauty secrets, cultural traditions and indigenous ingredients, Nyakio learned about the beneficical skincare uses of chamomile while studying ancient Egypt. As evidenced by Cleopatra's own archived beauty secrets, chamomile has always been regarded as a multi beneficial remedy. For generations noblewomen have crushed the petals and spread them over skin, leaving them with calm, refreshed skin. To this day the finest varieties of chamomile come from Egyptian farmers, as does Nyakio's. Sourced from Egypt, the finest varieties of chamomile came from Egyptian farmers. This really makes skin look amazing in the morning. Overnight, skin became naturally hydrated with this mask. Quenched the thirst of the driest skins, comforting cream works with skin's natural own recovery processes and ablend of chamomile, calendula, and aloe vera to wake up to softer, more supple skin that is radiantly youthful. NYAKIO is available only at ULTA. 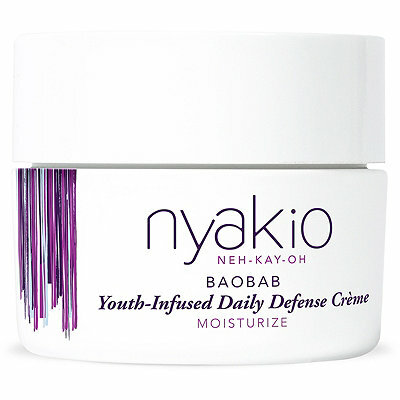 Restore's skin's natural glow and enhance protection with this youth-infusing daily moisturizer. Enriched with antioxidant-rich boabab oil, this lightweight crème helps defend against skin damaging free radicals. "Global beauty secrets. Cultural traditions. Indigenous ingredients. Baobab oil, derived from the coveted namesake superfuit in Ghana, is rumored to be the preserver of youthful beauty. Nyakio has always been fascinated with the baobab "Tree of Life" due to its high levels of vitamin A, E and omegas 3, 6 and 9. From the leaves to the roots, the baobab tree has been used for generations." This product tries so hard to get the skin back to an anti-aging state. It starts off the process but I don't think it continued it. Sometimes with these creams there is only so much they can do. It helps skin look younger yes, but it only does so much. Restore skin's own natural glow with this cream. Global beauty secrets. Cultural traditions. Indigenous ingredients. During her summers in Kenya, Nyakio discovered one of her family's beauty secrets through her grandmother, who was a Kenyan coffee farmer. Nyakio's grandmother finely crushed her fresh, antioxidant-rich beans and massaged the scrub with a piece of sugarcane onto her skin to reveal softer, smoother skin. 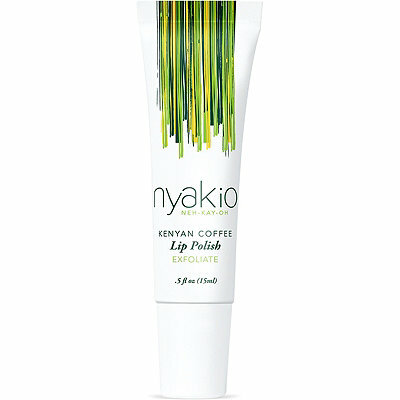 NYAKIO made this recipe into her Kenyan Coffee Lip Polish, Face Polish and Body Polish. Everyone loves the body polishes. The Kenyan Coffee Lip Polish takes all the dead skin off of the lips so that they are smooth and soft for lipstick and lip gloss all day long. Use in the morning before you put any other products on your lips. Apply a small amount to fingertips then massage around and rinse off with warm water. Lips will look and feel better. My favorite product I tried is the Chamomile Soothing Sleep Mask. That makes skin look amazing in the morning. Purchase NYAKIO on www.ulta.com and in Ulta Beauty stores. Like Nyakio on Facebook: https://www.facebook.com/NyakioBeauty; Follow Nyakio on Twitter: @NyakioBeauty; Follow Nyakio on Pinterest:http://www.pinterest.com/nyakiobeauty/ and Follow Nyakio on Instagram:http://instagram.com/nyakiobeauty.